Following pickup at your Aruba hotel, travel to Palm Beach's pier to board your luxury catamaran. Climb on board and greet your friendly crew, take advantage of the open bar and help yourself to some snacks while the captain navigates the boat towards your first stop. Stop at Catalina Bay, a secluded bay with calm, clear water that is ideal for learning to snorkel. Listen to a short safety briefing, don your mask, flippers and snorkel and jump in. In a depth of approximately 15 feet (5 meters) view sea fans and coral, and float through groups of angelfish, blue parrotfish and damselfish. 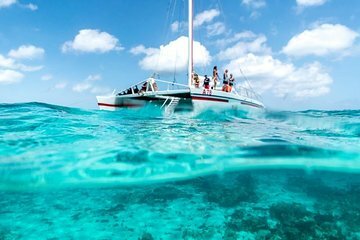 Climb back on board your catamaran and cruise towards the Antilla wreck. One of the island's most famous snorkeling spots, this 400-foot (122-meter) German freighter was purposefully scuttled off Aruba's waters in 1940 to avoid capture by the Dutch. Dive in and enjoy 30 to 50 feet (9 to 15 meters) of visibility around the ship, which is now home to an array of diverse marine life. See butterfly fish, stingrays, moray eels and yellowtail snapper. Swim over to the starboard side of the freighter, which is entirely covered with brain coral, star coral, and white-tipped fire coral. When your 3-hour snorkeling adventure is over, board the catamaran and enjoy more snacks and drinks as your captain takes you back to Palm Beach for drop-off at your hotel. Please inform Red Sail if you have children in your group that cannot swim, in order to arrange a mandatory life jacket for them while on board. Contact Red Sail directly to arrange a transfer to the pier, transfers are on request and based on availability and are only available for major hotels not in walking distance of our pier. The tour itself was good, but I didn't see many great fish. Great trip! Very windy so snorkeling was not very good. I totally recommend every one to do this snorkeling cruise sooo much fun and Booz and music great sun what more can you ask for!!!! This trip was wonderful- aside from the car forgetting to pick us up! We took a cab real quick to the pier which ends up we could have walked to from the Ritz. I cannot fault the sail crew for this! They were great and let you do your own thing! Snacks for delish, snorkeling was awesome, and drinks were flowing. A nice relaxing outing! Boat was comfortable and snacks were more than expected. Liked how we were given background info about the shipwreck!! Those who viewed the Antilla shipwreck came back very excited! Was impressed how the crew made sure people were comfortable with the choppy conditions before gong in the water. The pickup was 35 minutes late. We arrived and it was overbooked as the boat was extremely crowded and until people could sit in front they had to stand as not enough seating space. There was only mixed drinks for the open bar no beer or wine. The people on the boat were not overly friendly which was strange as the rest of the island is extremely friendly. I found snorkelling very stressful as way too many people in the water and fins were hitting you all the time. It also took forever to get off the boat due to the of people. Overall disappointing as we go on alot of snorkelling trips at various islands and I have always enjoyed them, this was a disappointing trip for sure.